The Dr. Mom™ Complete Nursery Care Kit includes 26 must-have pieces that allow parents to either groom or care for their child when they are sick. 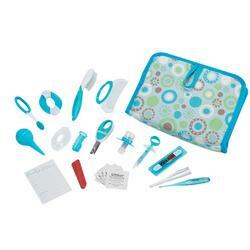 This comprehensive kit features all of the essential tools necessary for any new nursery within the home. A hard, durable storage case is included so parents can keep each item close at hand and in one convenient location.